Author: Vincent Erskine Aziaku. Series edited by: Herrmann Jungraithmayr, Norbert Cyffer, Rainer Voßen. 18 pp. Roman, 224 pp. 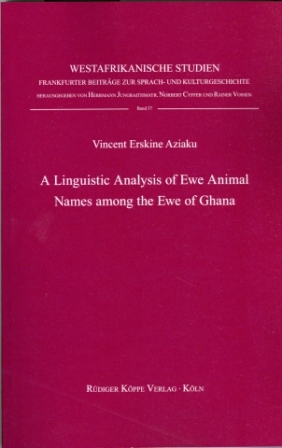 This study is a descriptive analysis of animal names among the Ewe of Ghana. The Ewe people of Ghana predominantly occupy the Volta Region located along the southern half of the eastern border of Ghana, which it shares with the Republic of Togo. 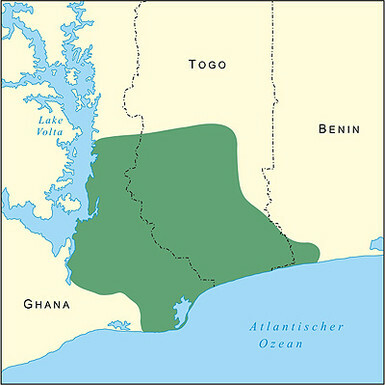 The region encompasses most of the vegetation zones found in the country and is ethnically and linguistically diverse (Ewe, Guan, Akan and Gurma). The predominant ethnic group is Ewe (68.5%). The Ewe language is a member of the Kwa language family, which constitutes a sub-unit of the Niger-Congo phylum. Scholars have observed that animal names have been an attractive field of study in African linguistics but seem to be rather neglected by linguists. Therefore the present study focuses on the Ewe ethnozoological ranking of animals, the morphological structures of Ewe animal names, a kind of etymology of animal names, and the sociolinguistic factors that influence the naming process. Scientific studies show that animals have been categorised into groups, and this taxonomic grouping of the species among folks needs to be established; this then provides a platform for comparison be­tween the scientific classification and the folk classification. The morphological classification of ani­mal names provides the basic morphological concepts that the formation of names is based on. The formation of animal names among the Ewe conforms to the various word formation processes includ­ing compounding, reduplication, and clipping. The present study describes the various nominalisation processes that were explored in the formation of animal names. Hence, it offers new perspectives of names and naming practices among the Ewe of Ghana and so provides the possibility of researchers to give attention to the structure of animal names.